An article about the 60th anniversary of the filing of the LEGO Brick patent at Forbes has revealed two new sets that, in the USA, will be exclusive to Walmart and priced at $19.99. It's likely that they'll be available elsewhere in the world so we'll let you know when we hear. 4000028 House and 4000029 Windmill are certainly 'old school' with design and packaging that would not look out of place in the 1950s or 1960s. In addition, 10715 Bricks on a Roll will be sold in limited edition retro packaging in Walmart, too. You can view pictures after the break. Thanks to shima55 for the news. @Huw are they $2.99 or $19.99? The Forbes article has them at $19.99. I would definitely get at $3, but at $20 i feel they are overpriced. At the price, it's no surprise that other clone brands, i.e. Lepin, are gaining in popularity. Wouldn't it be funny if Lepin did a clone of this? It's pretty sad that I would rather have the box than the set (bricks). 1) the box top of the 306 VW Garage Set (1958-62). 2) an early 1960s Ideas Brochure showing the elephant compound at a LEGO zoo. 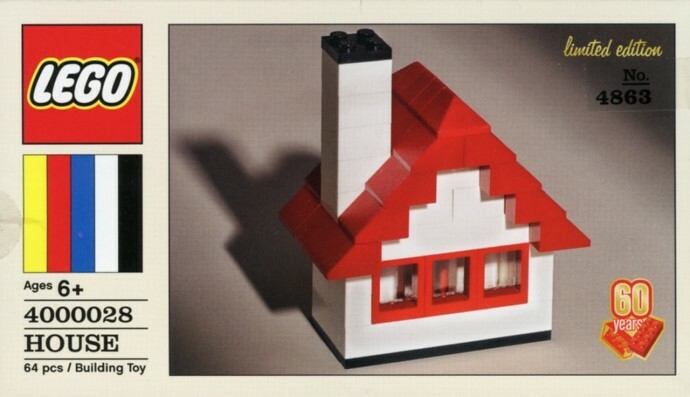 3) the front of Continental European LEGO catalogs of 1967. The little man on the left side of the box is the 1956-63 "LEGO Gnome", used on LEGO boxes, catalogs and brochures. The house is ok but the windmill doesn't look good. I could understand if it was a remake of an old set but its not! 318 Windmill Set is "cutting edge" design making use of the then-new smaller plates 3020, 3021 and 3022. $20 seems a bit ridiculous for these bricks by today’s standards. Though I wouldn’t be surprised if the old sets that inspired these cost that much… LEGO was crazy expensive in the 60s. Love the throwback packaging, though I don’t think I’ll be adding them to my wish list. @iriz, or 'slimbricks' as they were called back in the day! $ 20 is off course ridiculous for 64 and even more so for 45 pieces. But: these are special tribute editions and it is quite common that companies charge a mostly steep premium for that. Are they worth it? Well, that's for the buyer to decide. For me: I think I'll stick to the "free" set with purchases over X amount that they'll be offering shortly. 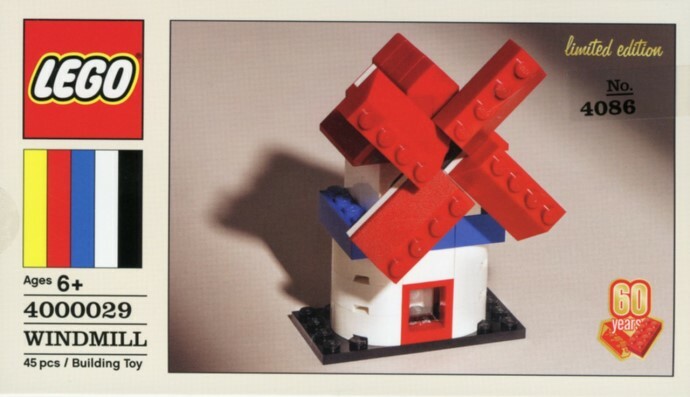 As for the sets themselves: the house is quite true to the original, the windmill might not be based on an existing old set, but for me it does breathe the construction style lego used a lot in those days, so is more a tribute to that time than to a specific set. Although somehow the construction of the blades does look familiar, maybe as one of the builds in the basic boxes with bricks they had then, or in an ideas book? I'm absolutely loving the box design, but those prices are just ridiculous. $20 for a piece count similar to a polybag is nuts. Unless I can find a really good sale, I'll probably end up passing (which is a shame). These sets are very neat, but just like everyone has said, they're too pricey. They really nailed the classic design. Nice classic look, crazy price. Apart from the box you can bricklink those sets for less than 5 Euro. So sad, the pricing structure of LEGO in 2018. Markups everywhere, and not the corresponding value. Seems the only sets worth their price nowadays are some large D2C, Ninjago and Ideas sets, and not even all of those. The upside is, 2018 will be such an inexpensive LEGO year for me, as I will hardly buy any of the new sets this year. LEGO should just start selling empty boxes (full of genuine LEGO air! ), mark them as limited edition collectables (limited to as many as they can produce), and charge $20-$100 depending on their size. There's nothing about this that can justify a $20 price tag and if you're trying to make that argument you're fighting a losing battle. This is just nostalgia driven greed. The most painful part for me is that they're only carried in Walmart. Well, that and the price. I actually think these are great value! Getting me into Walmart is difficult enough as it is, so telling me those are going for $20 makes me lose all serious interest. I would probably have gone for them at $10 as a markup for fancy packaging, but this is some serious price gauging. Those item numbers, #4000028 and #4000029 suggest to me these will be promotional items at some point. I'm guessing Lego will give them away at some point. Sometimes big box retailers get promotional items for sale - the new DJ polybag for example. I love the retro packaging, but I refuse to shop at Walmart, so this is going to be a non-purchase. If LEGO truly wanted to celebrate their 60th Anniversary, this should have been a LEGO exclusive, not a Walmart exclusive. ^^^ Hmm, maybe these actually will be promotional items at Walmart. Free if you spend $100 on Lego, valued at $19.99 (even though they really aren't). I'd buy the Bricks On A Roll set for 20.00, but the other two? HAHAHA!! Glad there's no need to add these to the Want List, although the retro packaging is cool. If they drop the price to 5.00 count me in. i like the house, but the windmill looks to "modern" with the curved walls! Got to be the house. Just so retro-cool, I can't ignore it. These are adorable, I love it--I'm not a big time "collector" and normally never buy without the intention of opening the box, but I may pick up the house or windmill and keep it MISB. I don't actually see them retaining any value unless they're MISB anyway. Collector's sets in the worst sense. $4.99 is what I would have expected. $5.99 at most for the larger pieces vs. a creator set from 2007-2017. The price has to be a joke. Sorry, but eventually the cow WILL be overmilked. These are simply awful. There is absolutely nothing appealing about the builds. Are they really expecting people to pay $20 for a "retro" cardboard box? Maybe if they were $5, I'd consider it but this is ridiculous. Looks freaking awesome. But that price is a joke. $20? Are you kidding me? "Hey! Sales are down! What shall we do?" "Let's throw out our Ridiculous Pricing Structure and introduce the new Ludicrous Pricing Structure. That'll solve our problems!" Yep ... easy pass for me on just about everything coming out this year. I'll rename my LEGO Fund to Racing Car Fund and get some value for money instead. 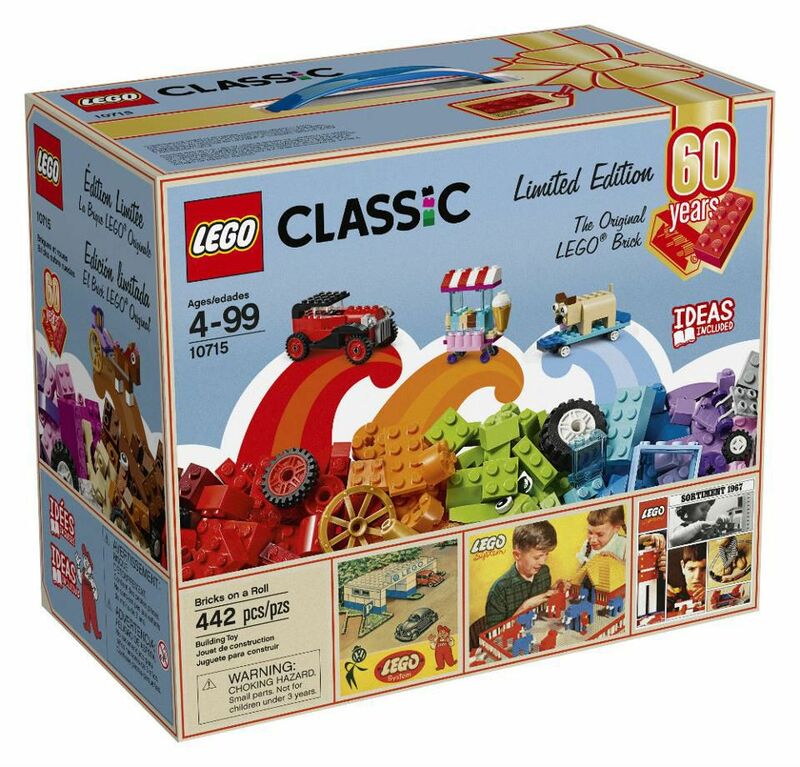 Man, I had hoped Lego would produce a wider variety of homages to celebrate 60 years of the brick, but it looks like we get a couple of paltry, early-60s' homages at ridiculous prices. The promotional set we're getting on the 28th looks better than either of those. If you buy those at full price, you've been suckered by a shiny box. I think what bothers me the most about these are the lack of the original parts. To me, any 'retro' sets with new parts misses the mark a bit for me. I get why they cannot, but I just think these would be far more special if they had the original molds for these parts. Being at Walmart is great. That means almost a guarantee they will be 50-75% off eventually with that ridiculous pricing. Makes me glad I spent my LEGO allowance on BrickLink orders for MOCs for the next month or two. If they'd released a set of the quality of the 50th Anniversary Town Plan, I would have blown out my budget big time! If the three sets were bundled together, I could see $20, but definitely not $20 each. I might get them, but only if they (undoubtedly) show up in the clearance aisle for $10. I'm sure that here locally, they won't sell at $20 each. I will get the house but keep it MISB because otherwise it’s a stack of common parts. I'll get the house event at $20 just for the box. This is one I would keep mint in the retro box...because, honestly, the model itself isn't anything special without the box to sell the retro look. How can those two sets be $20 each? That's totally insane. House is available now at Jet.com on sale for $19.97!! Windmill will be available 2/5/18. There is a third set: #4000030 Truck available 2/9/18.